He was a scholar of Chinese texts and a poet. His normal name was Ishii 石井 吉兵衛. His father was Ishii Motoyoshi 石井元好. At age 26 he left home and became a monk. He studied the Lotus Sutra 法華経. At age 46 he died at the temple Zuikooji 瑞光寺 Zuiko-Ji, which he had helped found in Kyoto.
. Memorial Days SAIJIKI - Spring . Monk Ennin 円仁　received abhisekha from the master Yuanzheng 元政 with the Diamond World mandala then received the initiation of the Five Pitchers.
. Kukai and ritual Pitchers . Gensei, a seventeenth century Nichiren sect monk, composed poetry in Chinese and was a leading figure among the literary elite of his era. "Grass Hill" offers translations of over sixty of these poems, as well as a dozen prose pieces and an extensive introduction to Gensei's work. Gensei (1623-1668) was a famous literary monk who belonged to the Nichiren sect of Buddhism. He was considered one of the best Japanese poets of the 17th century using literary Chinese, and he also wrote waka and travelogs. As a scholar, he wrote many books on the Lotus Sutra and other Buddhist themes. 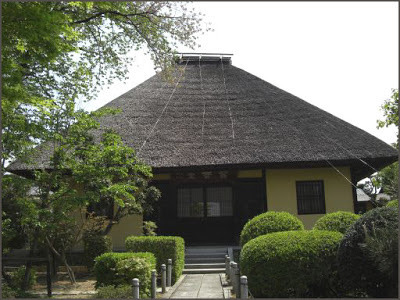 He did his best work after he moved to a small temple, Zuikouji, in Fukakusa, just south of Kyoto. Issa wrote this hokku in his hometown in the summer of 1821, when he was 59, but he had visited the Kyoto area several times when he was younger, so he may have gone to pray at Gensei's temple on one of those trips. The hokku seems to be based either on a memory or on memory plus imagination, since Issa is nowhere near Zuikouji Temple when he writes this hokku. Issa might even be returning in his imagination to the time when Gensei was still alive. And the hokku is written only four months after his infant son has died and less than a month after his wife has come down with a serious case of gout, one that eventually will take her life. Perhaps Issa is remembering Gensei because of his spiritual strength and endurance, persevering to the very end of his relatively short and sickness-filled life and never indulging in self-pity. As in other Issa hokku, the shell of the snail seems to be a heavy burden, yet the snail never gives up. In the midst of its slow travels, it takes a peaceful nap near the memorial at Zuikouji Temple to its spiritual precursor Gensei. Issa himself now seems to be spiritually napping in the memory of this memorial. Basho's verse is linked to the previous verse by Yasui that evokes someone making tofu at the beginning of a vegetarian period of mourning after his or her mother's death. Gensei's kind treatment of his parents was famous, and he died only two months after his mother's death, so Basho is suggesting that Gensei's sorrow is so strong after his mother's death that the great monk cries uncontrollably, so hard that even the sleeves of his monk's robe seem about to be torn apart, to say nothing of his mind. Issa's own sorrow for his dead son and his anxiety about his sick wife perhaps make him remember Gensei and Basho's view of the depth of Gensei's sorrow. The napping snail may offer Issa some hope of maintaining his sanity. The link shows a portrait of Gensei. If you click on the third small box from the left at the top, you can see several photos of the temple. It seems to have a lot of hedges, so I take that to be Issa's image. The note on Gensei in Issa's Collected Works 4:166 has a typo in it. It says Gensei died in Kansei 8, but actually he died in Kanbun 8 (1668). I've noticed several small typos in the Collected Works, which is natural in such a large work, even though it's well edited. I think it's a good idea to check all the facts mentioned in the notes in the CW against another source or two.